Updates to the DoD’s PGI 204.73 reveal new documentation requirements, which are expected to be included in future contracts. These requirements (called Contract Data Requirement Lists, or CDRL’s) are a way for acquisition officers within the DoD to standardize the responses they receive from contractors. The included CDRL will dictate a specific format and/or content requirements for your response. This format is called a Data Item Description (or DID). Supplier System Security Plan and Associated Plans of Action in accordance with NIST SP 800-171 Rev 1 Security Requirement 3.12.4 and 3.12.2. All of your Tier 1 Level Suppliers who receive covered defense information (CDI). For most DoD prime contractors: this represents an unprecedented amount of insight into their supply chain. If you are a subcontractor: this may be the first time DoD knows who you are. All of your Tier 2 Level Suppliers who receive CDI. This CDRL (tentatively titled DID-MGMT-XXXXX) is structured continue the trail of documentation (through as many supply chain tiers as necessary) until all entities who receive CDI have been identified (see section 2.3 on pages 13-14 of the DID draft). Your System Security Plans and Plans of Action. See ‘CDRL – Request Contractor’s System Security Plan and Any Associated Plans of Action for Contractor’s Internal Information System’ and Data Item Description DI-MGMT-82247 for DoD’s new requirements for a standardized system security plan. The result of these guidance enhancements is clear. The DoD will better understand the supply chain associated with each of its contracts. They will also be able to map the flow of CDI through that same supply chain, for compliance enforcement and cyber damage assessments. Additionally, these newly introduced CDRL’s and DID’s provide DoD with a standardized format and content for System Security Plans, allowing for the application of the NIST SP 800-171A assessment guide to contractors’ security documentation. 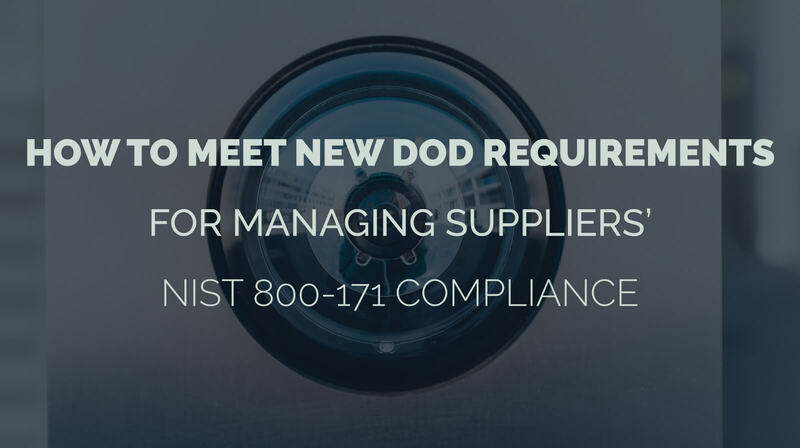 DoD contractors should become familiar with the required format and content of the new DID’s for their System Security Plans, and make adjustments to their original format as needed. Contractors should also establish a format for documenting their status as a Tier 1 Level supplier to any prime contractors they work with. Finally, contractors should develop a method for gathering Tier 1 Level supplier information from each of their own suppliers expected to receive covered defense information as part of future contracts. « Does Your Business Need Network Automation?